Introduced earlier this month, iOS 7.1 appears to be causing issues with personal hotspots for quite a few iPhone users around the world. Following the update, some users appear to be unable to save APN settings for personal hotspots, which have vanished following the update from iOS 7.0.6 to iOS 7.1. 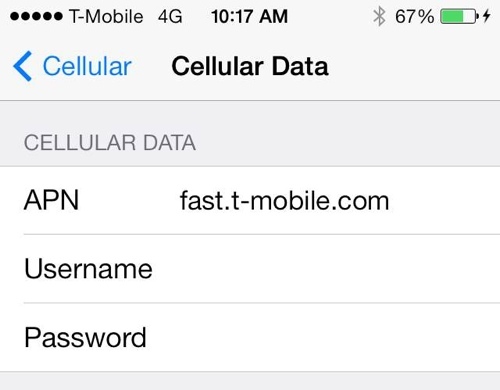 While information can be entered into the APN fields of the Cellular Data Settings menu, the values do not save, and attempting to establish a tethered connection results in an error message. Apple's Support Communities currently features a 15-page thread on the issue that was started shortly after iOS 7.1 was released, with many users reporting the same problems with tethering. Apple's support staff appears to be confused by the root cause of the issue, with several customer service representatives suggesting the problem lies with carriers. Carriers that have been contacted have indicated that it is an issue with Apple, however. Same here. Hotspot not working since I upgraded to 7.1. Such an annoying issue. I phoned my carrier this morning and they didn’t want to get involved since “it's a device issue since settings can’t be saved". No carrier updates either when I installed 7.1. So right now, no hotspot and no one wants to get involved. Other users have heard that it is a problem limited to carriers that do not currently have a contract with Apple. The iPhone 4, 4s, 5, and 5s all appear to be affected by the issue, and there is currently no available fix. Users in Germany, India, Austria, Spain, Serbia, Thailand, Estonia, Hungary, Belgium, Italy, Brazil, and more have reported issues with hotspots. My personal hotspot works fine but my wife's one has had issues for a while now. My personal hotspot is blissfully fine with iOS 7.1 running on an iPhone 5 on T-Mo's network. Used it with my MacBook Pro for about three hours yesterday. I'm glad someone got it! (I certainly haven't done for too long). I can't say I'm affected by it at all and I tether my iPhone to my iPad mini daily. Phone owners who previously made use of the Personal Hotspot feature on wireless networks that do not support it are now out of luck, after changes in iOS 7.1 have disabled the ability to manually edit tethering settings for unauthorized carriers. Apple is pretty sloppy with testing software in the real world. Why the hell is this so complicated anyway? If the phone has IP connectivity (internet access), Hotspot should work. PERIOD. All that "Personal hotspot" does is turn the phone into a NAT router and wireless access point. It NAT and forwards packets from a private network through the cellular connection. Why would a different APN be needed? If the phone can do data on its own, there's no reason why it shouldn't work in hotspot mode. This all sounds like Apple taking something which should be simple and making it a LOT more complicated than it needs to be. I was sharing system's internet connections with local networks back in 1995, using Linux on a 486. This is a SOLVED PROBLEM. Get your **** together, Apple+carriers!! !